Greensboro Beautiful has awarded New Garden Gazebo their September 2013 Business Landscape Award. 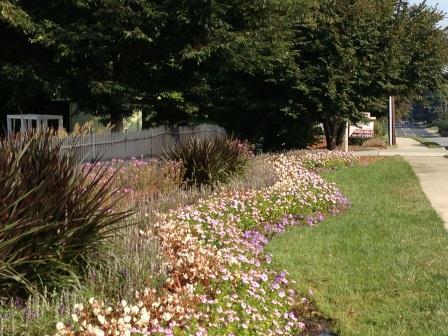 Greensboro Beautiful bestows the award on businesses, facilities and commercial properties in the greater Greensboro area which do an outstanding job of landscaping and maintaining existing plantings. Each month from May through October, a panel of volunteer judges evaluates nominated properties on a number of criteria. The judges determined that the mix of shrubs, the striking textures and the colorful, well cared for annual planting at the road front of New Garden Gazebo were worthy of recognizing. 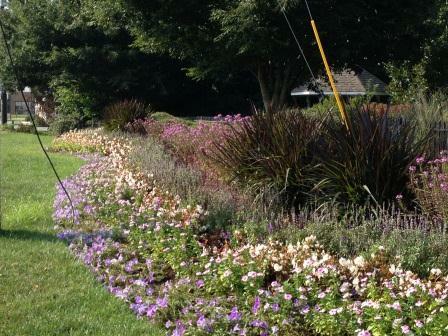 This year, the annuals included vinca, salvia, hybrid cleome, begonias, petunias and pennisetum grass. We would like to congratulate New Garden's Annual Flower Program Manager and designer of the seasonal color planting at the Gazebo, Merideth Story, the installation team, and the maintenance team that keeps it looking great all season long.